IMPORTANT: Before following the steps in this article, check if your computer has a stable Internet connection when connected directly to your broadband modem. Otherwise, contact your Internet Service Provider (ISP). MTU means Maximum Transmission Unit. It specifies the largest packet size permitted for Internet transmission. If your MTU is too large for the connection, your computer will experience packet loss or intermittent connection. NOTE: The Maximum Transmission Unit (MTU) of Linksys routers is 1500. Windows 10 - Right-click on the Start button on your desktop screen then select Command Prompt. 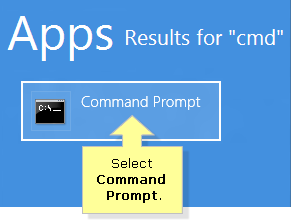 Windows 8/8.1 - Press the Windows key then enter “cmd” and select Command Prompt to open the application. Windows 7/Vista - Click the Pearl button on your desktop screen then enter “cmd” into the field and press [Enter]. Windows XP - Click Start on your desktop screen and click Run. Enter “cmd” into the field and click OK.
Mac OS X® - Click the Spotlight icon and enter “utilities” into the Spotlight field. Select Utilities and double-click Network Utility. Perform a ping test. Enter “ping [url] [-f] [-l] [MTU value]” and press [Enter]. Take note of the results. 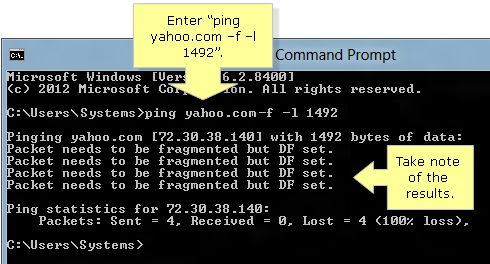 NOTE: In the image below, ping yahoo.com -f -l 1492 is used as an example. NOTE: Always start at 1492 and work your way down by 10 each time until you get a reply. If there is still no reply after the ping test, proceed to Step 3. 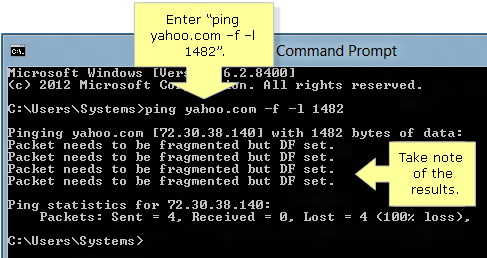 Enter “ping yahoo.com –f –l 1482” and press [Enter]. Take note of the results. NOTE: If there is still no reply after the ping test, proceed to Step 4. 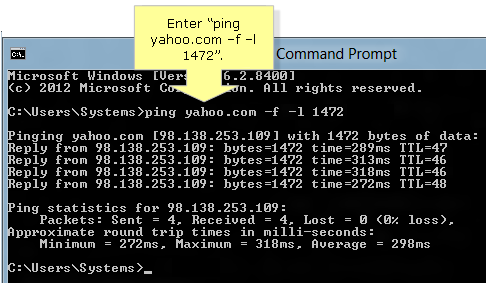 Enter "ping yahoo.com -f -l 1472" and press [Enter]. Take note of the results. Since you received a reply, take 1472 and add 28 to it for you to get the correct MTU size. In the example given above, 1472 is the proper value and the size would be 1500 for the network you’re working with. To change the MTU size on your router, click here. For Mac® computers, click the Ping tab and enter “[url] [-f] [-l] [MTU value]”. Then, click on the Ping button. Take note of the results. NOTE: In the image above, yahoo.com –f –l 1472 is used as an example. Always start at 1472 and work your way down by 10 each time until you get a reply. 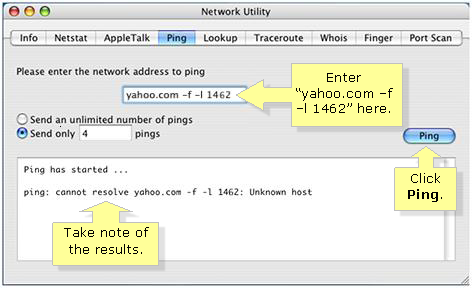 Enter “yahoo.com –f –l 1462” and click Ping. Take note of the results. 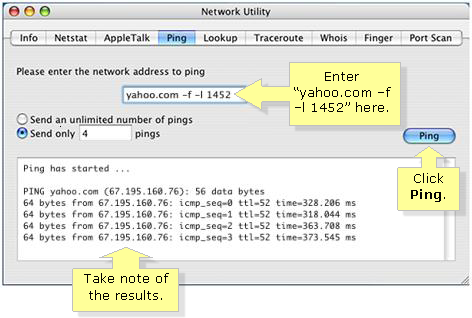 Enter “yahoo.com –f –l 1452” and click Ping. Take note of the results. NOTE: Since you received a reply, take 1452 and add 28 to it to get the correct MTU size. In the example given above, 1452 is the proper value and the size would be 1480 for the network you’re working with. To change the MTU size on your router, click here. The intermittent connection on the router might be caused by the cables connected to the router. Try using another Ethernet cable or check the power cable of the router if it is loose. Then check the connection again. A new firmware enhances the functions and features of your router and fixes the connection issues that you had previously encountered. To update the router’s firmware, click here.